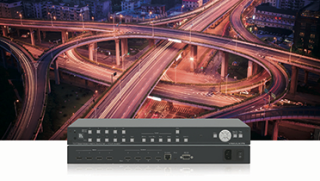 Kramer Electronics has released its new seamless VSM-4x4HFS Matrix Switcher/Multi-Scaler with video wall and multi-viewing modes. The company will be showcasing the product at ISE 2015 in Amsterdam as part of Kramer’s Pro AV solutions for live events. Kramer Electronics has released its new seamless VSM-4x4HFS Matrix Switcher/Multi-Scaler with video wall and multi-viewing modes. The Kramer VSM-4x4HFS offers the fastest and cleanest switching and scaling experience in the market. Designed for presentation environments, the switcher/scaler features a 4x4 matrix switcher, as well as video wall (2x2), dual display (PIP/P&P), and quad display modes. The video wall mode comes with Bezel correction options. VSM-4x4HFS includes PixPerfect scaling, Kramer’s high-precision pixel mapping, and scaling technology. The VSM-4x4HFS has 4 HDMI inputs and 4 scaled HDMI outputs and offers flexible control options, such as front panel buttons, IR remote control with OSD (On-Screen Display), RS-232, and a built-in Web browser.